If we’re lucky, our loved ones will lead rich and fulfilling lives well into their golden years, but we’re going to have to help them make that happen. ESSENCE identifies the critical issues, the timing and the resources you’ll need to care for the elders who once took care of you. There are currently some 3.5 million African-Americans over age 65 in the U.S. The Department of Health and Human Services Administration on the Aging predicts that within 40 years that number will double. If your loved ones are healthy and have a good quality of life, the senior years can be vital and happy. But as a person ages, she or he may slow down enough to need some assistance. Sometimes, it’s an unexpected illness—a stroke, a heart attack, a bad fall—that requires immediate care. “All of a sudden someone who was capable and doing things on her own one day literally the next day can’t be left alone,” says Edna Kane-Williams, vice-president of multicultural markets for the American Association of Retired Persons (AARP). If you’re a Black woman, it’s likely that at some point you will be the one providing that care. 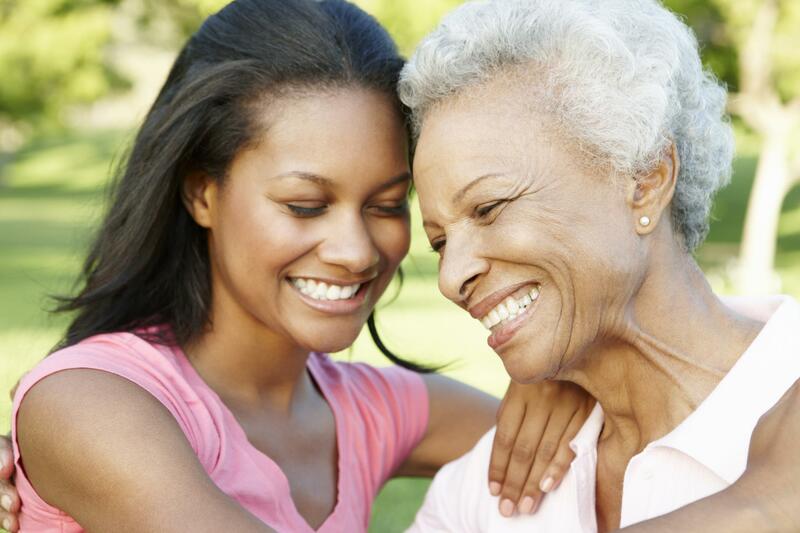 Daughters, nieces and other female relatives account for 42 percent of family caregivers nationwide, but among African-Americans, that number rises to 71 percent, says Kane-Williams, who takes care of her 91-year-old mother. WHAT IS MY ELDER’S HEALTH STATUS? Don’t just rely on Daddy’s summary: “Oh, the doctor says I’m fine.” If your elder is coping with multiple conditions such as diabetes, hypertension, Parkinson’s or other illnesses, managing care may mean communicating with a primary doctor and a bunch of “gists”—cardiologists, endocrinologists, urologists, neurologists and other specialists. But multiple doctors can mean conflicting care instructions. “Make sure that these other doctors are in communication with the primary doctor,” Mouton says. And try to be present for doctor appointments, he adds. In a busy medical office, it’s easy for an old person to forget to mention a concern or to misunderstand instructions. If you’re there, you can ask questions and make notes. Have your loved one fill out the Health Insurance Portability and Accountability Act (HIPAA) form so the doctor could discuss diagnoses and treatments with you. 1. A WILL ensures your elder’s wishes will be honored and names a trusted executor. 2. A HIPAA RELEASE grants a designee access to medical records and allows doctors to share health information. 3. A LIVING WILL states what life-sustaining measures loved ones want taken in the event they can’t speak for themselves. 4. A HEALTH CARE PROXY appoints someone to make health care decisions on an elder’s behalf. 5. A DURABLE POWER OF ATTORNEY allows you to represent loved ones in legal and financial matters. To find a local attorney, visit the National Academy of Elder Law Attorneys (naela.org), or use online resources such as nolo.com and legalzoom.com to create legally binding documents for as little as $35. Go to caringinfo.org for information and forms related to health care directives. CAN MY LOVED ONE STILL LIVE ALONE? When it comes to living arrangements, most seniors want to stay in their own homes, and experts agree that if they can manage it, that’s the best option. It allows them the comfort and convenience of being near friends, places of worship, established health care and other support systems. With certain illnesses, such as dementia, elders thrive better in familiar surroundings, says Susan Robinson, a specialist in geriatrics at Morehouse School of Medicine. For low-income elders who are able to manage some self-care, the federal Supportive Housing for the Elderly program provides subsidized rentals. Anyone who is at least age 62 can apply for Section 202 housing, which often includes assistance with finding needed support. If you need someone to do more than just sit with your relative, a certified home health aide can help with baths, meals, light housekeeping and basic care. Hire through a reputable agency that does thorough background checks and has liability insurance, says Kane-Williams, who suggests checking with aplaceformom.com and care.com for information on agencies. In some cases, it’s just not possible for an elder to stay at home: Perhaps her house isn’t accessible, or she requires specialized care, or dementia causes her to put herself in danger. Continuing care retirement communities (CCRCs) offer a range of options, including private apartments, assisted living residences and nursing-home facilities on one “campus.” Sometimes both members of an elderly pair need help—especially if one is trying to care for the other. CCRCs can offer the more mobile person a way to be “on campus” near the person who needs more acute care. Clearly, moving in with your elder is not for everyone. If you live far away or work long hours—and your loved one needs specialized or continuing health care—a nursing home may be your only other alternative. If elders have long-term-care insurance, the costs are covered, but for those who rely on Medicare or Medicaid, there are limitations (go to longtermcare.gov for specifics). Shop around for a well-run facility, and make sure you visit often to keep an eye on things, says Mouton. It will cheer your elder up and keep the caregivers on their toes. HOW WILL WE MEET THE COST OF CARE? Paying for a place to live isn’t the only cost. The pills, the bills, the gas, the groceries—it all adds up. And somebody has to make the decisions and write the checks. Even if your elder qualifies for Medicaid, Medicare and some of the other federal programs, there are many costs that are not borne by such programs, says Kane-Williams. For example, rehab care is covered by Medicare or Medicaid, but in most cases assisted living isn’t covered. In some states, Medicare won’t pay for a home health aide. While it will cover a nurse, a physical therapist or other skilledcare providers, the cost of an aide is likely to come out of pocket—yours or your elder’s. Depending on where you live, you can expect to pay $15 or more per hour for their services. With the Affordable Care Act in effect, a number of factors will determine what financial help is available to your family. Medicare.gov lets you input information about your specific issue and search for answers to your questions. The site could also help you identify programs for elders such as the Program of All-Inclusive Care for the Elderly (PACE), which helps you afford care for an elder outside of a nursing home. Aarp.org also has fact sheets about how the Affordable Care Act will impact coverage. As you help your relative figure out a plan to meet the cost of care, remember, these are grown folks we’re talking about. “They may be reluctant to accept help and will fight to maintain their autonomy,” warns Rita Hargrave, M.D., founder of the Ethnic Elders Care Network. Reassure your loved one that you only want to put things in place so you could carry out her wishes and care for her well. “These types of financial decisions are too important to answer based solely on what the woman at the senior center said,” notes Jeffrey Asher, an elder-law attorney in New York. To protect the senior’s assets—and your own—consider consulting an elder-care attorney with your loved one present. Meanwhile, have her compile a list of bank accounts, usernames and passwords, auto pay accounts, retirement accounts, insurance policies, bonds, deeds, titles and loan documents, suggests Hargrave. Put it in one safe place that you can get to in an emergency. When we recognize that an elder needs care, most of us just roll up our sleeves and make it happen. But it does take a toll. Studies show that caregivers are at high risk of health consequences—both mental and physical—because of the stress of caretaking. Here some family caregivers share their tips on self-care. SEEK ASSISTANCE. Even a frail elder has his pride. “They don’t want just anybody coming in helping them,” says L’Tanya Durante. “So you find yourself trying to do everything.” But you can’t. Instead, seek help in taking care of your loved one—and give yourself some breathing room. If the issue is having a stranger in the house, assure your elder that you won’t bring in anyone without a full background check. And promise a trial run. Remind Dad that having someone around to help can free him to do things he still loves to do. FEEL YOUR FEELINGS. Accept that resentment is normal. So are fear, guilt, anger and grief. But don’t ignore your emotions. If you find yourself tense and angry, L’Tanya suggests you ask yourself, What do I need? What am I mad about? What am I going to do about it? It’s critical that you make time to do something just for you. It might be five minutes on the phone with a friend or 20 minutes at a coffee shop. “I found just doing an errand by myself to be relaxing,” says L’Tanya. TALK ABOUT IT. “Even though caregiving is incredibly common, you often feel like you’re in it by yourself,” says Edna Kane-Williams of the AARP. Folks who’ve been there can give you pointers for navigating your own caregiver maze. Eldercare.gov can connect you to your local Area Agency on Aging, and AARP’s caregivers’ portal offers online support groups. HOW DO I ASSEMBLE MY TEAM? • CAREMANAGER.ORG The National Association of Professional Geriatric Care Managers Web site connects you to professionals who can help select appropriate housing, monitor health care and provide help with finances. Call 520-881-8008. • ELDERCARE.GOV This site links to local and state agencies that offer services ranging from insurance, housing and transportation to legal issues. Search by topic or ZIP code. Log on or call 800-677-1116.